Take the tangenziale west, skirting Milan, from the autostradas A1, A4 or A7. Exit from the tangenziale (main road) following the sign to Stadio San Siro (exit n.3). Proceed on route SS11 in direction of Stadio San Siro for 3,4 Km). Take the sharp turn to the left following the local authorities sign for the Cemetery. 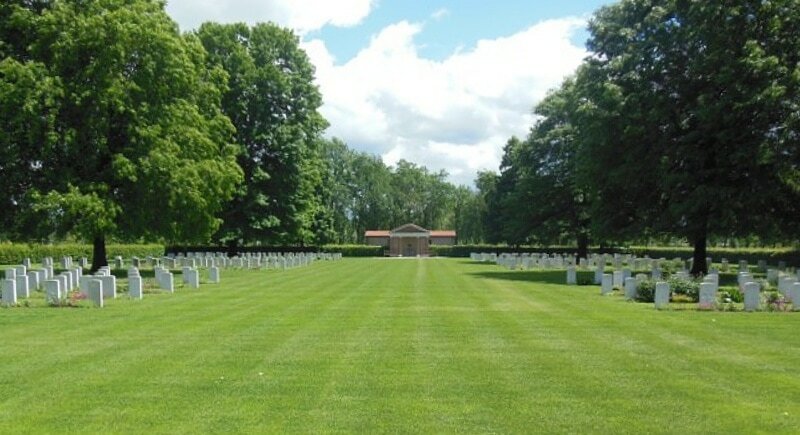 The cemetery lies in a large park (Parco di Trenno) approximately 0.5 kilometre along on the right. From the city centre head west following signs for the San Siro football Stadium. 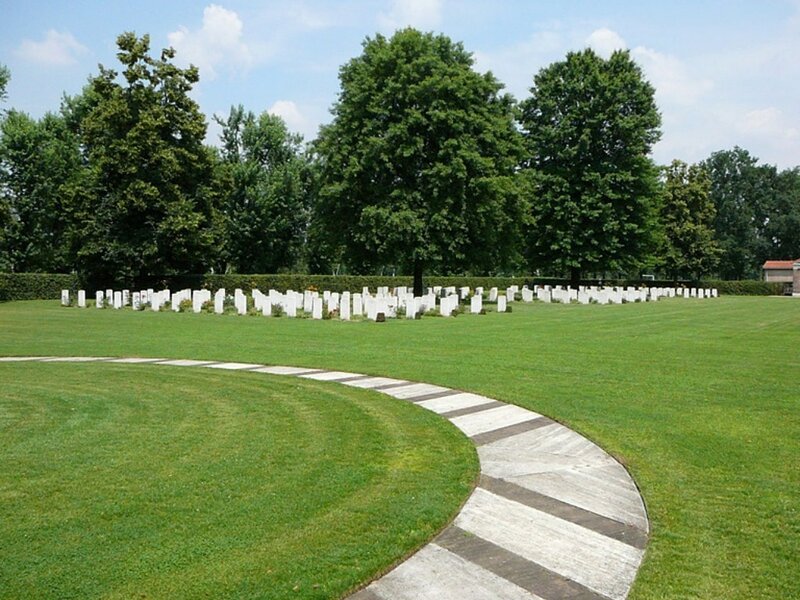 The road which runs past the stadium has local authority signs for Milan War Cemetery. If travelling by train, the nearest station is Milano Centrale located in Piazza Duca d'Aosta in the city centre. From there a taxi service is available. Cemetery address: Via Cascina Bellaria s.n. - 20153 Milano (MI) Lombardia. 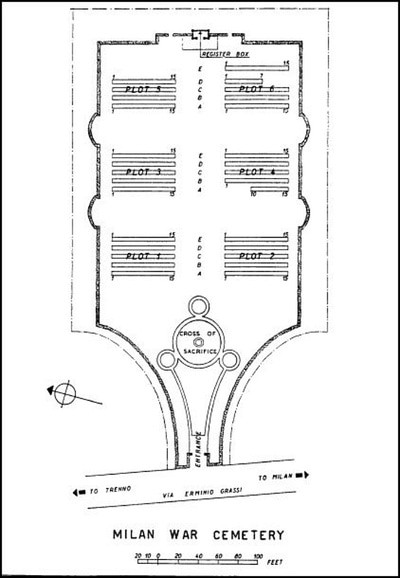 Wheelchair access to the cemetery is possible via the main entrance. Part of the main gate is locked with a combination padlock and can be unlocked using the combination 1221. 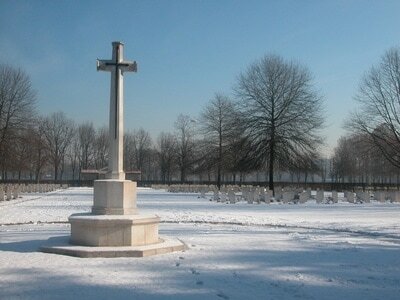 As Milan fell to the Allies largely without a fight, the Commonwealth forces suffered few casualties. Most of the graves in Milan War Cemetery were those of prisoners-of-war or airmen and were brought in from the surrounding towns and villages - places such as Bergamo, Boves, Carpi, Cicagna, Modena, Parma, Piacenza, Turin and Val d'Isere - after the war.